Glide through treetops to Revelstoke's most beautiful breakfast view, overlooking the Columbia River as it winds through the lush valley below the towering Monashee Mountains. Wind your way up through subalpine rainforest to spectacular mountain views, wildflower meadows or an alpine lake on The Stoke Climb, Greely Trail and Subpeak Loop. Please Note: The Pipe Mountain Coaster, The Revelation Gondola and our hiking trails are currently closed. Lower Mountain trails and activities will open May 17, 2019. Beginning at the south end of the village, Bottoms Up guides hikers to Revelation Lodge through a series of switchbacks, criss-crossing the glades and meadows of the lower mountain. While the trail is an easy grade it does climb, so be prepared! This shorter trail loops from the top of Bottoms Up to partway up the Sunshine ski run, and back down to Revelation Lodge. We recommend hiking the switchbacks up through the forest and taking the ski run back down. This trail mirrors Revelstoke's infamous ski run of the same name, with a tough climb through steep and rocky terrain, crossing under the Gondola line and winding through boulder fields. It can be accessed from the Gondola midstation as a climb or the upper Gondola station as a descent. Either way, be prepared and make sure you have plenty of water. This is a multi-use trail, please watch for bikers. 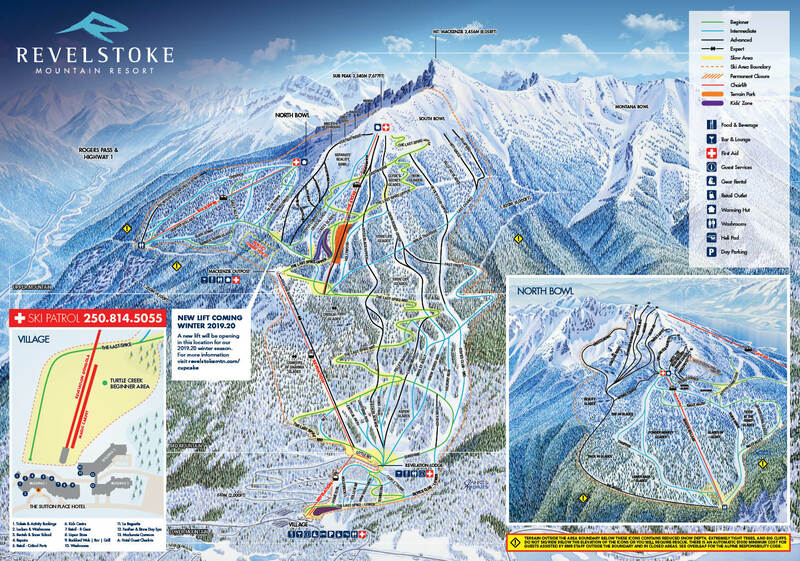 The Stoke Climb can be accessed from Cupcake Loop starting at the upper Gondola station. This trail climbs up several switchbacks through subalpine rainforest and above the treeline into the alpine. Catch jaw dropping views of the surrounding peaks and the Columbia River below. Subpeak Loop can be accessed from the end of The Stoke Climb Trail. This technical trail takes you along the spine of Mount Mackenzie and to the subpeak, sitting at 2,300 metres above sea level. This loop will provide stunning 360 degree views of the surrounding mountains and the valley below. Greely Trail can be accessed via The Stoke Climb Trail off of Cupcake Loop which starts at the upper gondola station. This trail winds through subalpine rainforest and eventually brings you to the beautiful Greely Lake, nestled beneath the peak of Mount Mackenzie. Spectacular mountain and valley views are available on the lower mountain, while the upper mountain hosts mile-high views of glaciated peaks. Try our delicious buffet breakfast on the Revelation Lodge viewing deck, playing host to a panoramic view of the Monashee Mountains and Columbia River. With a short stroll from Mackenzie Outpost, step out onto a viewing deck pointing towards the Monashees. Glaciated plateaus and rugged peaks stand tall amongst the clouds. With a short walk through the forest, access a unique aerial view of Revelstoke. From the top of Kill the Banker's imposing cliffs, you'll see our community nestled amongst the mountains we call home. For the ultimate mountain experience, let us show you around the place we know best. Join us on a full or half day hike that starts with a gondola ride into the subalpine forests of Mt Mackenzie. Winding through the subalpine forests, walk along ridge tops in the alpine with breathtaking panoramic views and stunning alpine meadows. Prices include a ride up the Revelation Gondola. Lunch is provided on the full-day guided hike. Max group size is 8 people. The Stoke Climb and Greely Trails are multi-use trails. Please use caution while hiking and watch for bikers. Find the latest Summer ticket and package rates for Revelstoke Mountain Resort. Current hours of operation for activities, lifts, and amenities at Revelstoke Mountain Resort.